Supergiant Games' award winning action role-playing game Bastion is now available on the iPad, and it's one of the best experiences you can have with the Apple tablet. Just don't ruin it by playing without headphones. 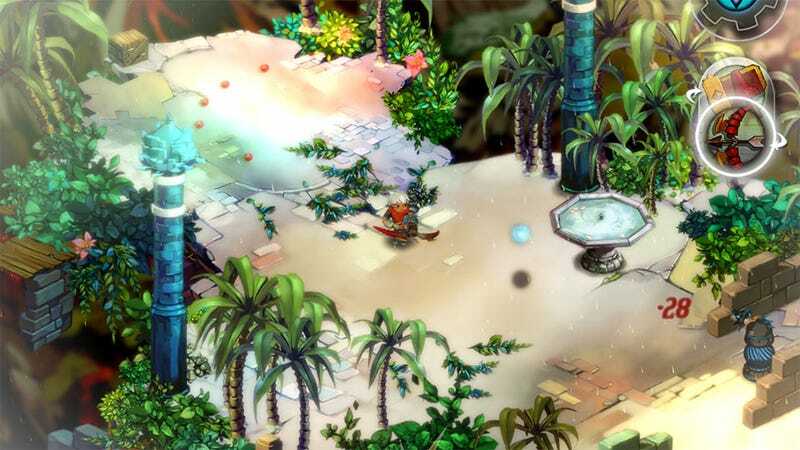 The gorgeous hand-painted graphics and the shooting and smashing gameplay make the trip to the iPad intact, but those aren't the main draws of Bastion. It's the deep, growling voice of the game's narrator and the rich tapestry woven by the game's gorgeous soundtrack that make this game so damn pleasurable, and that's not something you're going to get out of that tiny, tinny grill Apple passes off as a speaker. I was horrified as I started to play the iPad version, ignoring the suggestion that I should don headphones for the full experience. The poor narrator sounded trapped, caged in a world in which his sonorous pipes were rendered impotent, their magic ripped away cruelly. And then the music started. That glorious tapestry unraveled before my ears, sound meant to lovingly caress my hearing places at both ends condensed into a cacophony of raw, stabbing noise. One 3.5mm plug later and all was right with the world once more, apart from the whole thing falling apart. Bastion is now available for the iPad 2 and new iPad for only $4.99. Use the extra money you should have paid for this masterpiece to buy yourself a capable set of cans, or buy some portable speakers and share the magic with the world.